Windows Phone 7 is far from perfect and is missing some important functionality, but overall this is a refreshing change for Microsoft. 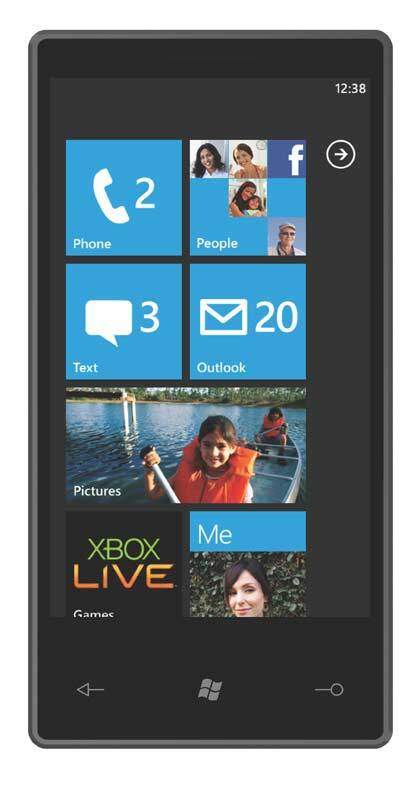 Effectively starting with a fresh canvas, Windows Phone 7 is slick, easy to use and well designed. Time will tell whether Windows Phone 7 devices will make a significant impact on the market, but if you're looking for a new smartphone, a Windows Phone is definitely worthy of consideration. Microsoft's all-new mobile operating system, Windows Phone 7, is an entirely different beast to its clunky predecessor, Windows Mobile 6.5. Featuring an attractive, fresh and easy-to-use interface, Facebook integration and a full mobile office suite, Windows Phone 7 isn't perfect but its refreshing look and feel and consistent performance makes it a valid alternative to competing smartphone platforms. Read our Samsung Omnia 7 smartphone review. Read our LG Optimus 7Q smartphone review. The user interface of Windows Phone 7 is completely different to anything currently on the market. It's made up of large tiles that can be organised any way you wish; tiles can be "pinned" to the home screen, and the default tiles can be removed. You can simply press and hold a tile and drag it to move it around the screen. The tiles offer a refreshing look and feel, with large text and live images. For example, the "People" tile — a centralised hub for multiple forms of communication with contacts — displays live photos of the last few people you've interacted with. There's a theoretical limit of about 150 tiles that you can pin to the home screen, but this is more than you'll ever need. The Windows Phone 7 homescreen is made up of live "tiles." Up to 150 tiles can be pinned to the homescreen, so you can personalise each device as you wish. Swiping to the left opens Windows Phone 7's main menu, a scrolling list of applications in alphabetical order. The inability for a user to organise these apps may prove problematic down the track, but considering you can pin anything to the home screen, the main menu will be accessed far less than when using most smartphone platforms. We wish you could pin an individual setting to the home screen — you can pin the settings menu to the home screen, but you can't pin the Wi-Fi setting as a tile, for example. This would have made it quicker and easier to access commonly used settings like Bluetooth and Wi-Fi. The general concept of Windows Phone 7 is that each application or hub is a panorama — slide up or down to reveal more content, and slide left or right to flick to a new section. For example, the People hub consists of a list of people you've had recent contact with, all of your contacts and a What's New list that integrates real-time Facebook and Windows Live updates. Below each screen are context-dependent circular icons — as an example, when you are in your message inbox, a "+" icon opens a new message, while when you're typing a message a paperclip icon can attach a photo and the mail icons sends your message. There may also be a small "..." icon, which will reveal more options available for the current screen (usually settings). The best aspect of the Windows Phone 7 interface is its simplicity. The home screen and the main menu are the only major screens you access, aside from opening various hubs and applications. Everything seems to be where it should be and the interface is not crowded or busy. Performance is excellent; screen transitions are smooth, scrolling feels natural and there is minimal lag or delay when opening or closing applications. The entire user experience feels streamlined and refreshing — completely the opposite to previous Windows-powered smartphones. The Windows Phone 7 UI even makes the iPhone and Google Android interfaces feel slightly dated. Microsoft has a strict set of hardware requirements for manufacturers of Windows Phone 7 devices, so the experience is virtually identical regardless of handset. The phonebook in Windows Phone 7 has been renamed "People" and comprises phone numbers, social networking accounts and e-mail accounts. The idea is that contacts are tied in with multiple sources, meaning you can read Facebook status updates, view photos and see other information all from one portal. The idea works relatively well and the linking of contacts is reasonably intuitive — for example, Windows Phone 7 will automatically link identical contacts from multiple sources (a contact from Facebook and from Google contacts from example), while photos sourced from Facebook are used as images of contacts. Conveniently, you can pin individual contacts to the home screen. We were annoyed that there is no option to not show Windows Live contacts. For users who previously have used a Windows Live account purely for MSN, this will mean you're left with a list full of e-mail addresses that will need to be individually linked to contacts. There is also no built-in Twitter capabilities, which is a strange omission. 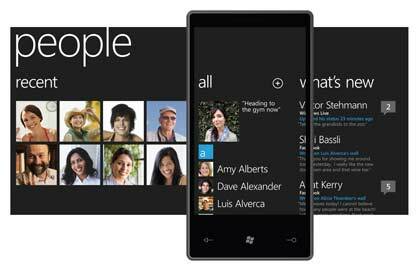 The Windows Phone 7 People hub combines phone numbers, social networking accounts and e-mail accounts. Setting up a Windows Phone 7 device is a simple process: enter your Facebook, Windows Live ID and other e-mail accounts (naturally, the OS supports Microsoft Exchange e-mail) and the phone automatically grabs your contact list and keeps it updated in real time. You can choose to add all your Facebook contacts to your People hub, or simply add Facebook info for the contacts you already have. Windows Phone 7 smartphones will come in many shapes and sizes and some will include physical, QWERTY keyboards. Any manufacturer producing a device with a physical keyboard will need to do a sterling job because the on-screen software keyboard is simply excellent. We found it more comfortable and accurate in landscape mode, but it works well in portrait mode too. The keys are well spaced and make a soothing clicking sound when pressed, while the built-in spell check allows you to tap on a word to bring up a list of suggested corrections. Users switching from older phones with numeric keypads and predictive text input will still take a while to get used to any touchscreen keyboard, but those switching from an iPhone or Android smartphone will be very impressed with Windows Phone 7's text entry. E-mail on Windows Phone 7 is excellent, aside from the lack of an aggregated inbox for multiple e-mail addresses. Microsoft has said that an aggregated inbox would become too cluttered, and that most people would prefer to keep work and personal e-mails separate. We would prefer to be given the choice — the iPhone has both individual and aggregated inboxes, for example. Unlike the iPhone, Windows Phone 7 allows you to view e-mails by all, unread or flagged messages, again simply by swiping through the panorama screens. Tapping on the left side of the message allows you to mark individual messages to delete, mark as read, mark as unread or flag.